I know, I know, this poor blog has been neglected as all of my blogs have been. I love blogging, but I just don't have the time to keep up with all of the blogs I try to write. 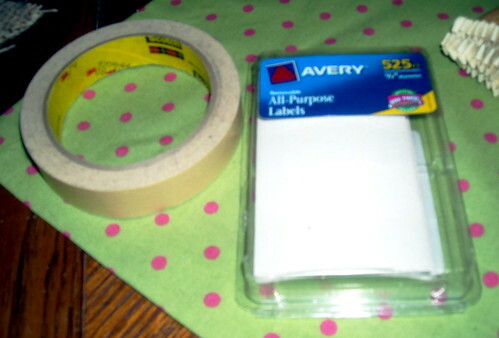 Since last writing in here I have taken up many different crafting projects. 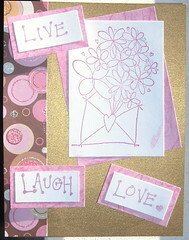 I have recently gotten into decorating cards. 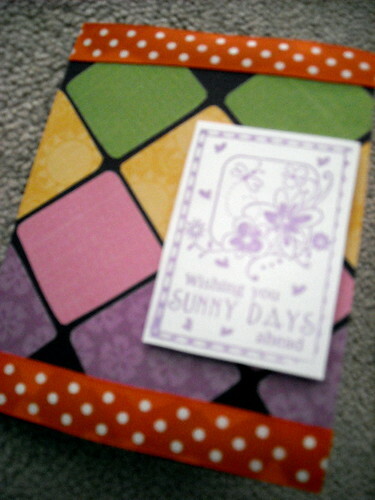 My favorite thing about making cards is you can make one and then model a bunch around the same idea. Plus, it takes less time than scrapbooking. These two Valentine's Day cards were made for my prayer group. We all made Valentine's Day cards for each other. This Valentine's Day card is my favorite. I made a bunch like it this. You can see the other ones at my FLICKR ACCOUNT. Each one was made by punching out hearts and then adding buttons in the center. I love how the results are clearly Valentine's Day without being too romantic. This worked well as I sent these cards to many of my friends and family members. I would highly recommend sending your friends and family members Valentine's Day cards. It was amazing the responses I got to them. So many people feel alone on Valentine's Day just because they may not be dating someone, but this is a friendly reminder that there is someone out there that cares and loves them. Valentine's Day isn't just about a significant other, it is about telling people you love them and care about them! 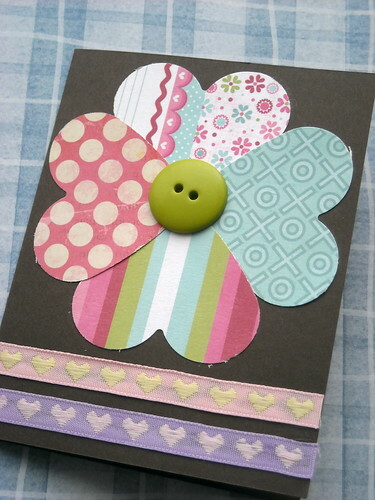 I really like making handmade Thank You cards. It is such a personal touch! 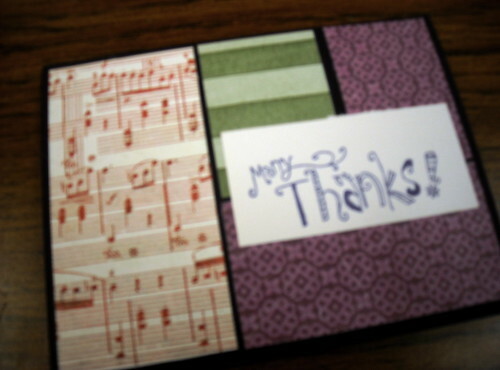 This Thank You card was inspired by a picture on pinterest. 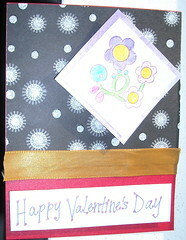 And finally a card just for fun. It turned out really nice if I do say so myself! 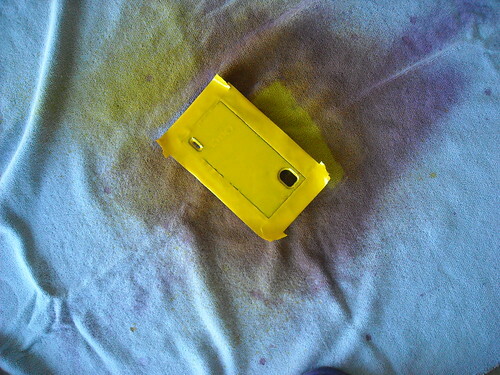 I got a new phone a few weeks ago. 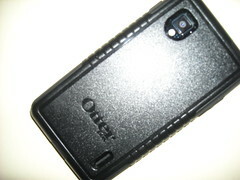 I am really excited about it, but the only problem is it is so new that I could only get the otterbox in black. Now normally I would be okay with this, but one of my good friends that I spend a lot of time with has the exact same phone with the exact same case. It can make life a little bit more confusing by having two phones next to each other. Yes, they are set-up different, but who wants to check every time they grab their phones. 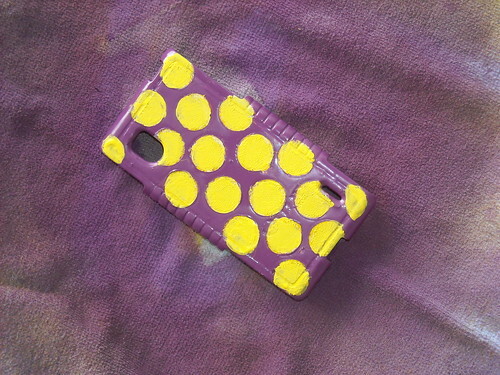 First, I taped the whole back of the phone case and then painted the phone case purple as I wanted the sides to be purple. 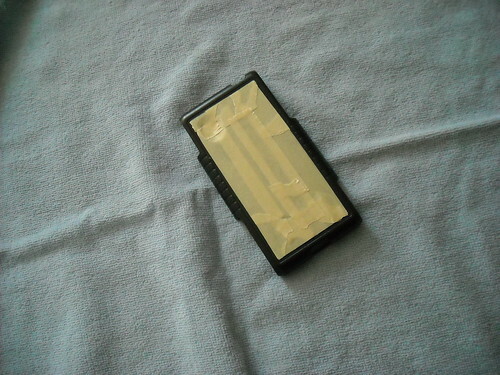 Next, I taped around the square back and painted just that area yellow. This will soon be the polka dots. After letting the yellow dry (REALLY let it dry! Otherwise it kind of peels off with the stickies. 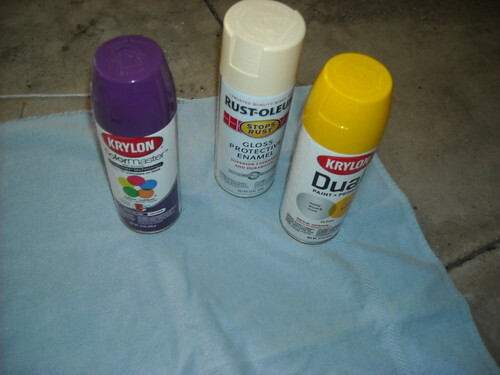 Plus, you can get rid of some of the tackiness of the adhesive by sticking it to fabric before sticking them to the paint.) 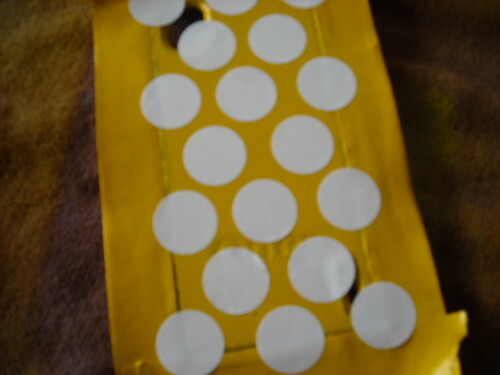 stick the adhesive dots to the back. 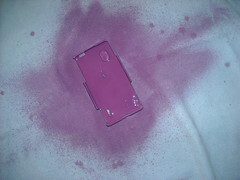 Paint the whole thing purple again. 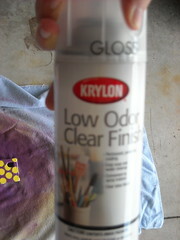 I accidentally bought gloss that is also a color, so I finished and then sprayed it a random color. 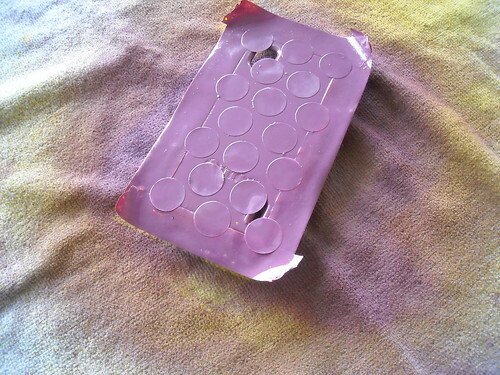 :( It was really sad, but I did fix it and finished it with a gloss to hold it in place. I have been planning on writing a post about this Christmas for about a month now. However, as you can see my month has gotten away with me and it is almost midnight on Christmas. However, the Christmas season continues into January, so I feel it is fine to still write about Christmas even now. It is interesting how Christmas tree decorations tend to give you a glimpse into a persons interests. The tree I have, I received as a Christmas present in high school. 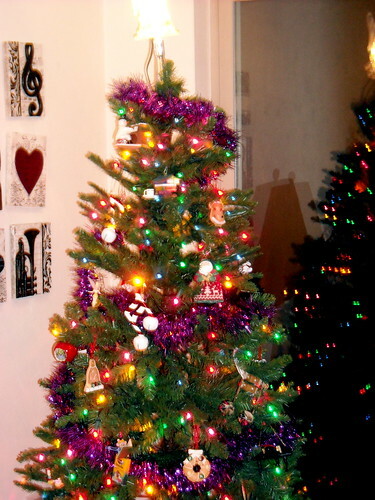 You can probably imagine that my Christmas tree is decked with purple garland and all sorts of musical ornaments. 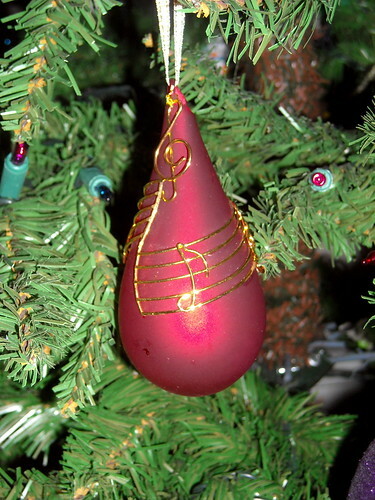 I love all the jingle bell music notes and musical themed ornaments that cover my tree. Christmas in Pulaski was much different than our 'typical' Christmas, but nice nonetheless. We had homemade macaroni and cheese with hot dogs, salad, and broccoli. Much different than our normal fancy Italian dinners we normally make. It was nice to have my parents come to my apartment and go to church here in Pulaski. On Tuesday, we will head to Illinois to see my brother, sister-in-law, and niece. I always look forward to time I can spend with them and we will be celebrating with my uncle, aunt, and two cousins this year. We rarely find time to celebrate with them during the month of December so this will be a nice change. The only thing missing is seeing my sister, but unfortunately I will have to wait for a while before I see her again. I know I should be working on more 60 Quick Knits for Em and my blog. 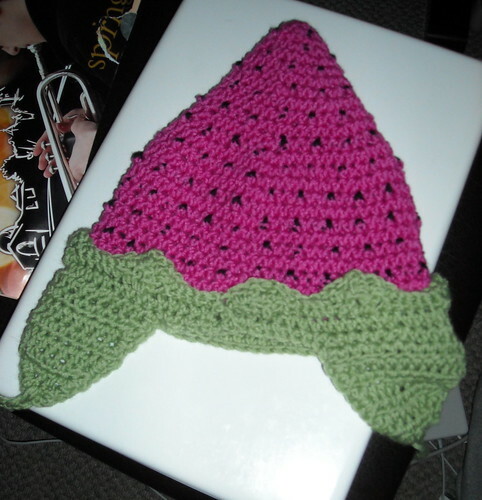 However, I have suddenly gotten an itch to crochet some hats. Ever since the trip to Stitches Midwest this August I have found my passion for crocheting yet again. I cannot explain it, but suddenly my eyes were opened to all the wonderful patterns you can crochet. Now don't get me wrong I still love knitting, but crocheting was one of my first crafting loves and I am happy to be back to it. 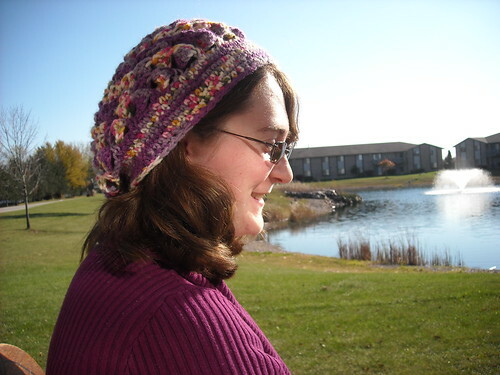 When I went to Stitches I saw this woman, Pam, at the Halos for Hope booth wearing a GORGEOUS hat (pictured above). When I saw it I knew I had to have it. 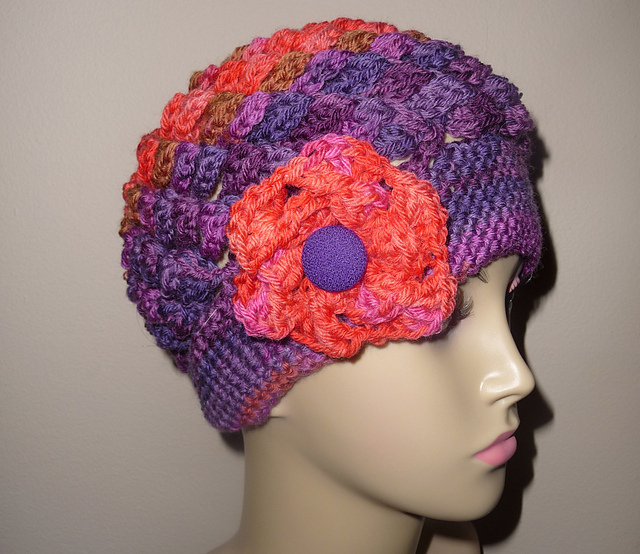 I talked to her about it and she told me it was a crochet pattern that you could find in Annie's Attic - Chemo Caps and Wraps. She did not have any copies at that time, but by the end of the weekend I had purchased a copy that was signed by her! It was very exciting. My friend Em wanted to crochet the hat as well so I had to try it out a few times to make sure it came out alright. (I tend to teach better when I have completed the project myself, especially because I can kind of freehand different stitches and fix mistakes as I go.) After making one hat, which has received many compliments from both my students and friends. 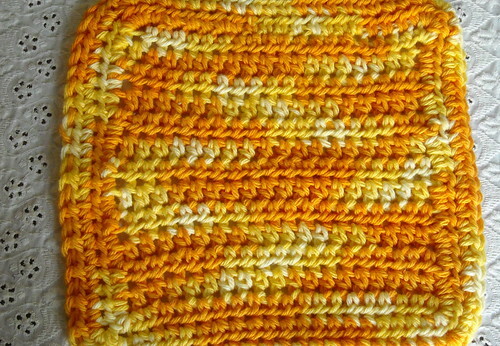 The pattern is rather simple but works up like a cabled knit pattern. 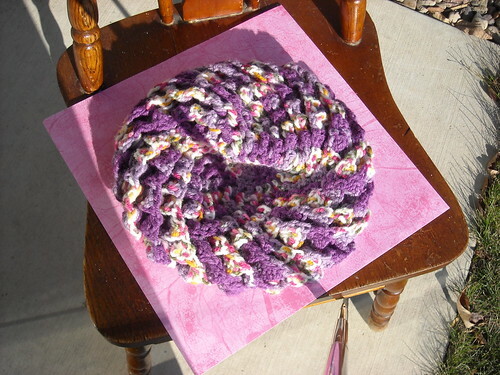 It especially looks beautiful in a variegated yarn. Since I made the first one I made another and am about half way finished with a third hat. Last night I sat down and helped my friend Em through the process of crocheting the hat. She is not particularly comfortable with her crocheting skills, but I helped her successfully crochet the hat in just a few hours. (She only has a little single crocheting for the brim to do.) If she can make it through this pattern so can YOU! The only tricky thing is first learning the DC foundation (from back to front) followed by the Twisted DC Foundation. I looked up a YouTube video to help me get through the stitch a couple times and then it became second nature. Before you know it you have a beautiful hat. I know it has been a while since I posted in this blog. In case you do not know already, my friend Em and I are currently writing a blog about knitting all the patterns from 60 Quick Knits. You can read and check out our blog here. 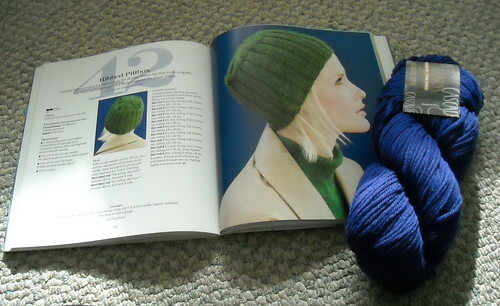 Though I have stayed busy knitting all the beautiful patterns from Cascade Yarns: 60 Quick Knits. I still have taken a few breaks in the last few months to express my creativity in different ways. Some of these include, decorating my music classroom with bulletin boards, scrapbooking, and a few knitting and crocheting projects not from the book. I would like to catch you all up in the next few weeks with my many projects. 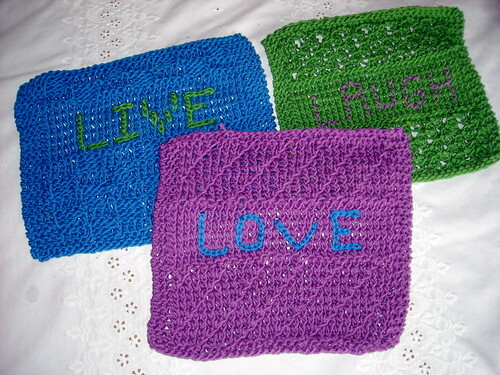 Today, I am going to share the dishcloths I made a few months ago. In May, I had a friend from high school get married. For a bridal shower gift, I decided to make something rather practical that I know anyone can use. I decided to knit and crochet several dishcloths. The ones pictured above are knit out of soft cotton. The colors were so vibrant and my friend, Rachel, said they were so pretty she was almost afraid to wash dishes with them. You can find the pattern for these dishcloths here. 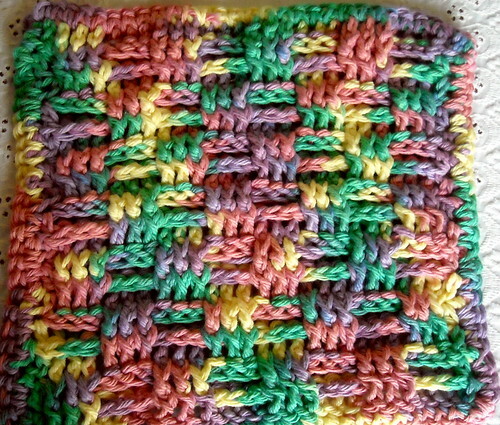 The blue dishcloth is the basketweave pattern. 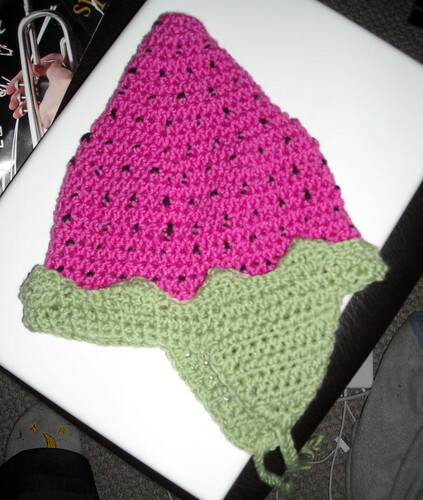 The green dishcloth is the bramble pattern, and the pink dishcloth is a creation of my own. 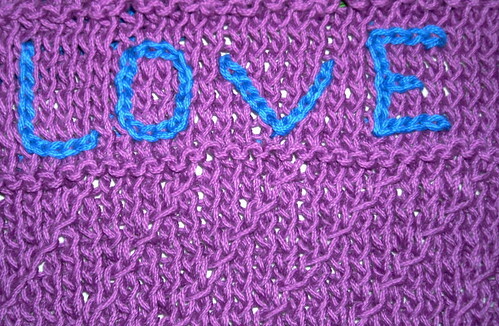 When you take a closer look at the dishcloths you will notice I added the letters different ways. I experimented with chain stitching and back-stitching. Personally, I prefer to just knit the letters in. If I were to redo these that is what I would do. All three of these patterns are free patterns that you can check out too! 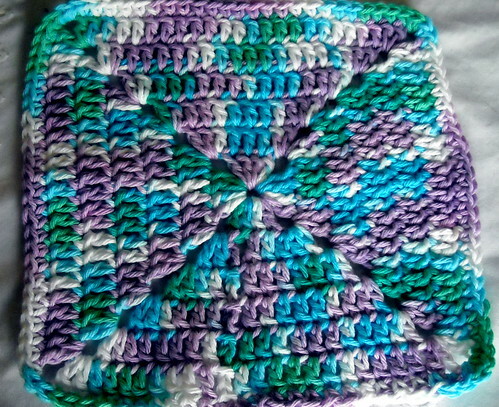 Pattern #1 - Simple Dishcloth, Pattern #2 - Basketweave Dishcloth, and Pattern #3 - Granny Square Dishcloth. For these I used left over Sugar and Cream yarn. Altogether, I was VERY happy with the results. I hope you enjoy them too. If you have any questions about the patterns just let me know! :) You can also check out more pictures of this project and others at my Flickr Account. Well, I have not been working on any projects that are not in the 60 Quick Knits book since Em and I are trying to finish all the projects. As of yesterday we had 17 projects completed. 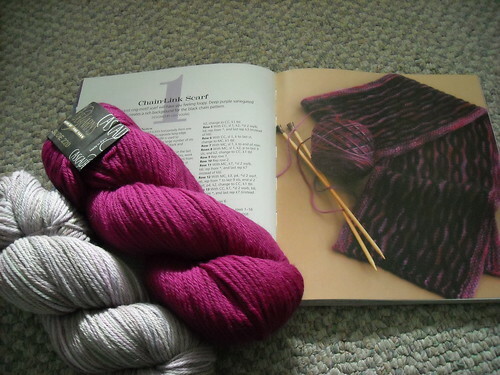 If you would like to see more about how that adventure is going check out our blog 60 Projects from 60 Quick Knits. 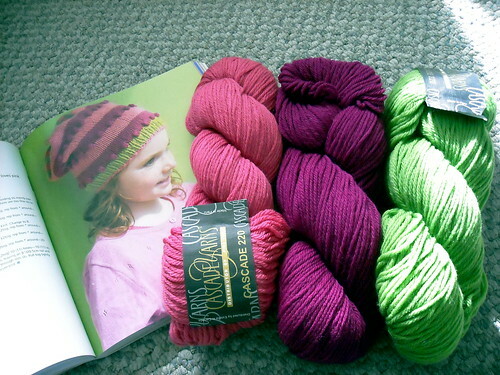 Anyways, what I would like to blog about today is how much I am LOVING making all these patterns with Cascade 220 yarns. 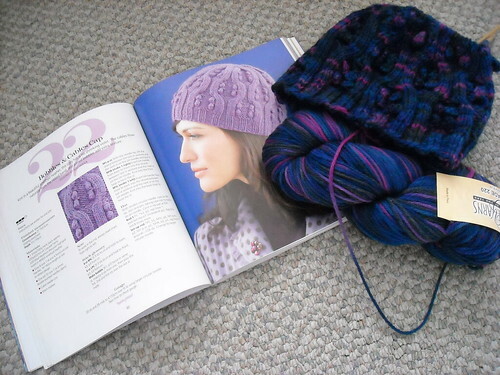 I had almost finished with project #22 - Cables and Bobbles Cap, when I found that I had run out of yarn. 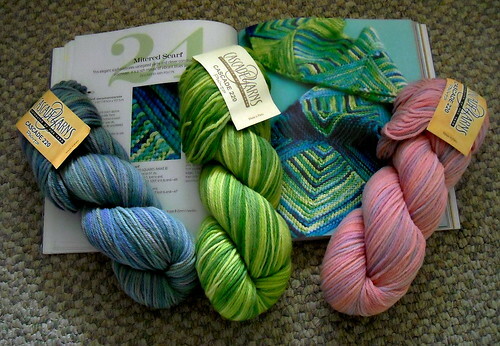 Normally, I would have been worried as I bought this yarn at a LYS that closed this summer. 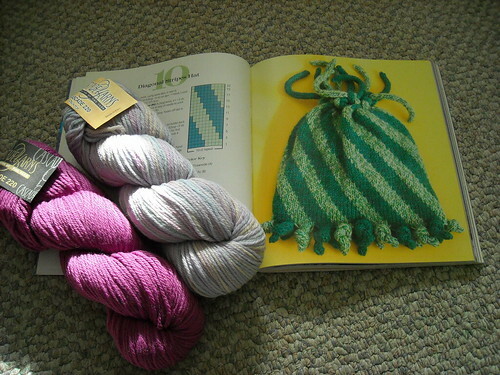 Luckily I knew the exact color and could buy the yarn online. 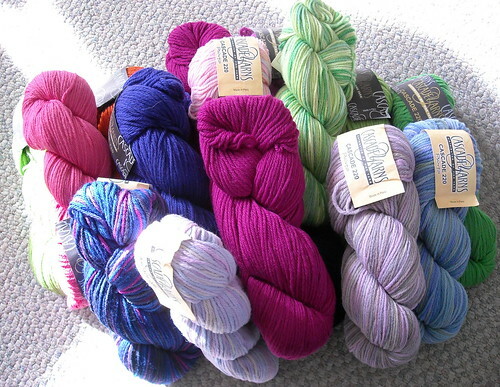 I went to Yarn Country and ordered LOTS of Cascade yarn to use for more 60 Quick Knits. Below you can see a picture of all the yarn that I received in the mail. If any of these projects catch your eye keep checking our blog for updates! Back in November my sister-in-law asked me to make my niece a new hat. I made her a cute purple ear flap hat last year for her first birthday. My sister-in-law said it was starting to get kind of small and Taylor (my niece) now has a hot pink coat. 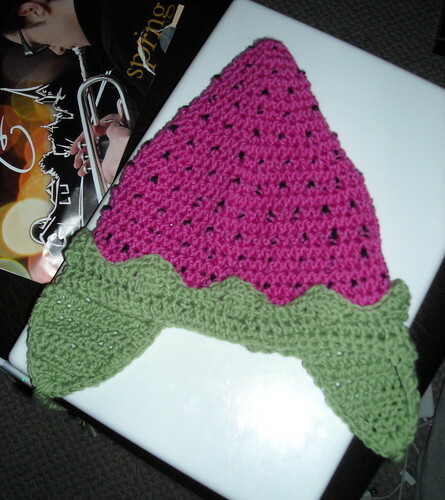 After rummaging through all my knitting and crocheting books my sister-in-law loved the idea of a cute hot pink strawberry hat. At first we were both thinking having a stem on the top of the hat, but then she mentioned liking the ear flaps to keep Taylor's ears warm. That is when I decided to make the strawberry upside down. That way the bottom of the hat could be the leaves of the strawberry and two rather large leaves could be the ear flaps. I debated for a few days and drew some sketches and thought about how to do certain things. I finally started crocheting the hat in late December. By January 5 the project was complete.